Identifying patients who are likely to have obstructive sleep apnea (OSA) is vital. As overnight polysomnography, the criterion standard diagnostic test, is expensive and limited in its availability, many people with OSA, perhaps as many as 93%, remain undiagnosed.1 Effective screening in primary care settings could increase the number of OSA patients identified, who can then be offered continuous positive airway pressure—an intervention that might reduce morbidity and mortality. I searched the literature and put together the results of the 2 studies that employed findings practical to the primary care setting and that used polysomnography to diagnose OSA.2,3 From these studies, I came up with the mnemonic APNEIC, which can be used to recall the 6 attributes of OSA observed in clinical practice: Age older than 50 years; Pharynx grade III or IV; Neck circumference greater than 35 cm; Excessive weight (body mass index > 27 kg/m2); Incisors forward (ie, overbite); and Cricomental distance less than 1.5 cm (Box 1). Materials required include a tape measure, a ruler, and a scale. BMI—body mass index, OSA—obstructive sleep apnea. The Mallampati pharynx grade is obtained by asking patients to open their mouths and stick out their tongues as much as possible. If the pillars of the tonsils are visible then the pharyngeal grade is less than III (Figure 1). Avoid asking patients to say “ah” and do not use tongue depressors, as these maneuvers will cause an underestimation of the pharyngeal grade. Neck circumference is measured at the level of the cricothyroid membrane. 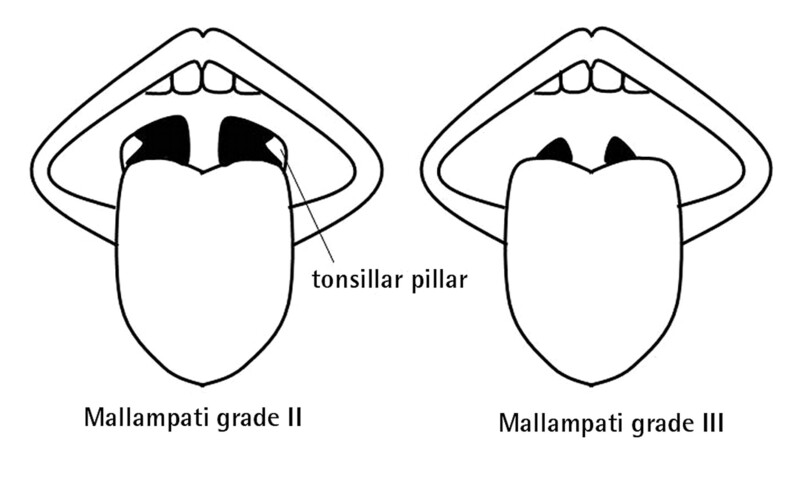 Grades II and III of the Mallampati pharyngeal grading system. A grade of III or IV applies if the pillars of the tonsils are not seen. The presence of an overbite is determined by asking patients to close their mouths normally then retract the lips (ie, “Show me your teeth while keeping them clenched”). If the upper teeth are in front of the lower teeth, an overbite is present. The cricomental space is measured by putting a straight edge (eg, a ruler) between the cricoid cartilage and the inner chin, while the patient holds his or her head in the neutral position. 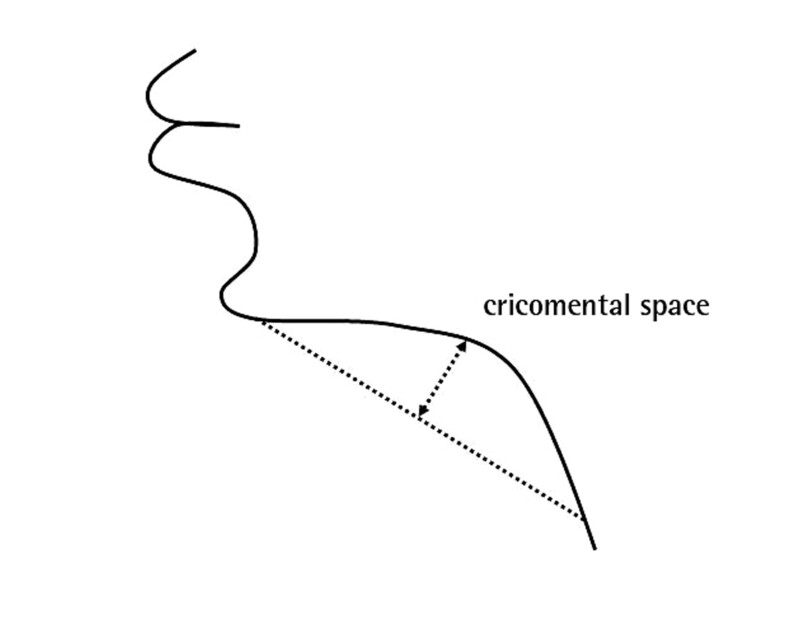 This cricomental distance is then bisected and the perpendicular distance to the skin of the neck is measured (Figure 2).3 Using a thick instrument such as a tongue depressor should be avoided, as it might cause a slight underestimation of the cricomental distance. The Berlin questionnaire4 and the STOP questionnaire5 are other screening tools for OSA, which are based on historical attributes (history of loud snoring, history of daytime somnolence, etc); both questionnaires have positive predictive values of approximately 50% and negative predictive values of approximately 70%. The STOP questionnaire, which involves questions about snoring, daytime tiredness, observed apnea, and high blood pressure, is a sensitive screening tool.5 It can therefore be combined with the clinical attributes described above and can be remembered using the mnemonic STOP APNEIC.
. Estimation of the clinically diagnosed proportion of sleep apnea syndrome in middle-aged men and women. Sleep 1997;20(9):705-6.
. Craniofacial profile in Asian and white subjects with obstructive sleep apnoea. Thorax 2005;60(6):504-10.
. A decision rule for diagnostic testing in obstructive sleep apnea. Am J Respir Crit Care Med 2003;167(10):1427-32. Epub 2003 Jan 24.
. Respiratory arousals in mild obstructive sleep apnea syndrome. Sleep 1999;22(5):583-9.
. STOP questionnaire: a tool to screen patients for obstructive sleep apnea. Anesthesiology 2008;108(5):812-21.